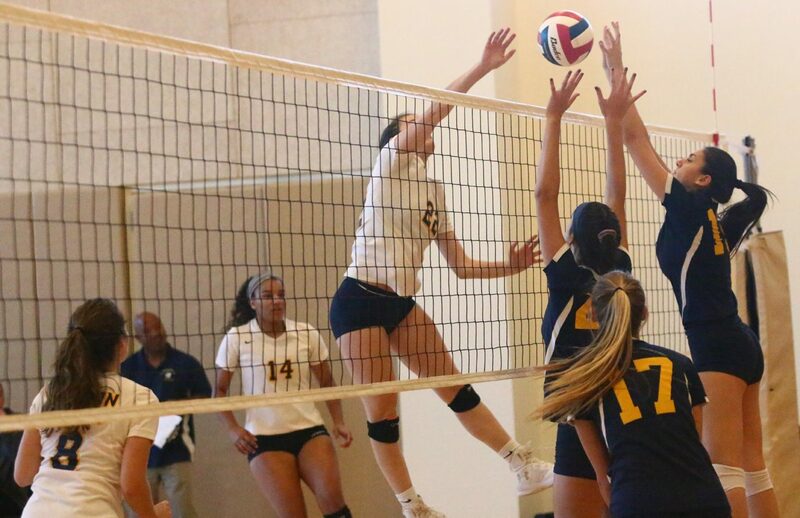 It came down to the very end when the Merion Mercy Academy Golden Bears called a timeout with a 14-13 lead late in the fifth game of the match Sept. 29 against the visiting Pope John Paul II Panthers. That turned out to be the right call at the right time as Merion Mercy got the one final point they needed and edged Pope John Paul, 3-2. Merion Mercy finished with scores of 14-25, 25-17, 25-19, 21-25 and 15-13. The non-league match had been tight all the way as both teams played well on offense and defense. Home court advantage in a brand new facility helped the Golden Bears emerge victorious on the day. Merion Mercy improved its overall record to 11-1 on the season with the win. Pope John Paul dropped to 10-2. Leading the way on defense for the Panthers was Simone Sparano with 25 digs. Jordyn Young (41 digs) highlighted the Golden Bears defense. She could not have done it without her teammates. After two games, Merion was ahead, 2-1. The Golden Bears were vying to get the win in the fourth game but the Panthers came roaring back. Late in the game they held a close 22-19 lead and, after a time out, captured three of the next five points. They grabbed the game and forced a fifth and decisive frame. The final game again was close, with never more than a three-point gap in the score. Merion held its largest lead of the game at 14-11, but a time out by the Panthers helped them cut it to 14-13 before the Golden Bears took the time out they needed to seal the win. Alex Pizzi paced Merion Mercy with a total of 65 assists. Teammates Nicole Nowlan (14 kills), Anne Butler (12 kills) and Makenna Hallagher (six kills) also contributed. Pope John Paul turned out to be one the toughest opponents Merion Mercy has faced all year. Mary Kate Mooney (23 digs, 17 kills), Maddie Lesinski (23 assists, 15 digs), Mikaela Monroe (12 kills), Julia Durand (five kills) and Chelsea Harvey (16 assists, four aces) all led the Panthers.